The "American Cruisers" Collection is available once players complete the final task of Mission 1 of the "Hit Hard! Hit Fast! Hit Often!" campaign. Earning the first collection item via completion of the campaign task or purchase of special containers from the Wargaming store unlocks the ability for collection items to drop from regular Containers earned through daily missions. The overall collection is comprised of eight sub-collections. Each sub-collection grants a different reward. 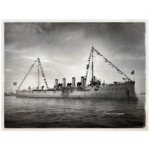 After obtaining all 48 items in the collection, players are rewarded with an alternate permanent camouflage for Tier VIII cruiser Cleveland. Cruiser St. Louis, named after a city in the state of Missouri, was laid down in 1902. At the early stage of design, it was planned to build a series of ships based on the design of the U.S. flagship in the Battle of Manila Bay, cruiser Olympia, with some improvements. According to that design, the ship would have had a displacement of 6,000 tons, combined armament including heavy and rapid-fire guns, and a speed of 20 knots. 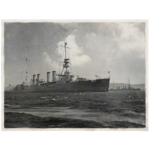 However, at one of the American shipyards, cruiser Varyag was laid down for the Russian Navy. She was bigger than Olympia's descendants, carried 152 mm guns and her speed was up to 23 knots. That forced the American engineers to revise the design. When St. Louis entered the U.S. Navy, she had a displacement of 10,000 tons, fourteen 152 mm guns, and a speed of 22 knots. The armor belt protecting the propulsion provided a significant advantage compared to other same-type ships with rapid-fire artillery, most of which were protected by an armored deck. After her trials, the beautiful new ship with four steam stacks and snow-white sides shining moved to San Diego from New York. On the way, this cruiser entered many Latin American ports where it made a good impression, and passed from the Atlantic Ocean to the Pacific Ocean through the Strait of Magellan. 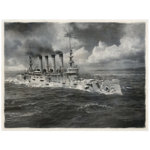 The U.S. Navy exercise of 1902, which was the most large-scale naval drill of that time, revealed an extreme lack of reconnaissance ships in the U.S. Navy. Such ships should be high-speed, large, and able to operate on the open seas, far from naval bases. As a result, in 1905, a project to create a cruiser with a displacement of 3,700 tons and a speed of 24 knots was undertaken. Very high boards were one of her constructive peculiarities, which allowed her to maintain a high speed, even in a storm. 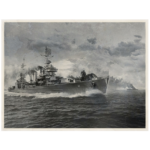 Originally, the armament of the ship should have included only 76 mm guns, which were recognized as powerful enough to counter destroyers of that time, but during the design, some of them were replaced with 127 mm guns. In 1908, under the project, Chester, Salem, and Birmingham were commissioned. They were the only ships that officially entered the U.S. Navy as "scout cruisers". During her service, the lead ship of the series participated in a few spectacular naval parades, escorted the steam ship Carpathia with surviving passengers from the cruiser liner Titanic on her way to New York, and ,in 1914, played a key role in capturing the Mexican port of Veracruz. During World War 1, this cruiser even attempted to ram a German submarine, but failed. 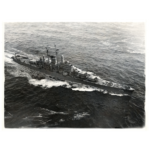 In 1921, USS Chester ended her active service, a few years before the first generation of light cruisers of the Omaha class joined the U.S. Navy. The information that Japan was building Mogami-class cruisers armed with fifteen 155 mm guns shocked the U.S. 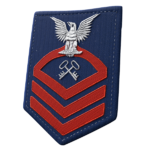 Naval Command. The project for a light cruiser with 152mm artillery, which had been in development since 1930, was quickly revised, and her four triple turrets were complemented with a fifth. In 1935, when most of these cruisers had already been laid down, an updated project was prepared. The advanced design had a new propulsion system and a full-fledged dual-purpose artillery consisting of the newest twin 127 mm turrets. A year later, two ships — USS St. Louis and USS Helena — were laid down, becoming part of the Navy in 1939. Light cruiser Helena became one of the victims of the Japanese assault on Pearl Harbor on 7 December 1941, being hit by a torpedo once. 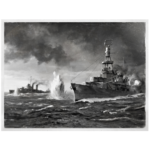 After completion of the repair works in the summer of 1942, the cruiser actively joined the fight for the Solomon Islands, taking part in several major battles, the most successful of which being the night battle of Cape Esperance in October 1942. Thanks to being equipped with the latest radar, USS Helena was the first to disclose the approach of a Japanese squadron. 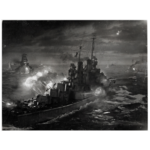 Allowing the enemy ships to approach, the cruiser was the first to burst her rapid fire at the Japanese. 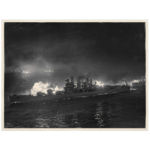 USS Helena’s shells proved fatal for destroyer Fubuki and set cruiser Furutaka ablaze. The result of the battle was a hasty retreat of the defeated Japanese squadron. Cruiser Helena’s promising career tragically ended in July 1943, when three 610mm torpedoes from Japanese destroyers sank her in the Battle of Kula Gulf. Unlocks the ability to mount two flags on all American cruisers. When World War II broke out in September 1939, all international agreements imposing limits on the naval weapons development ceased to exist. The US Navy Command could replenish their growing fleet with light cruisers without considering their water displacement. However, the world conflict was intensifying, so they had to act quickly. In order to save the time required to design a project from a scratch, the recent "big" light cruiser-- St. Louis and Helena--were used as a basis for the new project. 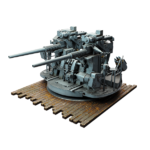 A requirement to reinforce the ships AA capabilities and desire to mount advanced gunfire control systems and surveillance radars led to the decision to remove on of the 152 mm turrets. The resulting light cruiser, armed with twelve 152 mm guns, was in no way inferior to most ships of her type in terms of main battery firepower, and out matched all of them in terms of AA gun strength and an abundance of modern equipment. The second ship in the series, USS Columbia, named after the state capital of South Carolina, was constructed almost concurrently with the lead ship, USS Cleveland, and was commissioned in July 1942. The most impressive episode of her combat service was her participation in the Bougainville Campaign (the Solomon Islands) in November 1943. On November 1, four Cleveland-class cruisers, including USS Columbia, delivered extremely intense fire with their rapid-firing guns on the enemy positions on the island. Several hours later, during the night Battle of Empress Augusta Bay, they managed to fend off an attack by a powerful Japanese squadron on the Americans landing place on the Bougainville island without loss. 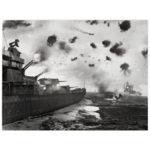 Shortly afterwards, in the morning of November 2, USS Columbia, together with her three sister ships, repelled a massive enemy air raid during which they shot down more than 20 aircraft, again without loss. Unlocks the ability to mount two flags on all American battleships. Five-inch (127mm) caliber guns were very popular in the U.S. Navy. The 127 mm guns (Mark 1) first appeared in the arsenal of the U.S. Navy cruisers in the 1880s. By 1901, a new, long-barreled, five-inch Mark 5 gun had been developed, and a few years later its slightly modified version, the Mark 6, was created. Despite that, all loading operations were done manually, Mark 5/6 guns could fire 6 to 8 AP shells, weighing 22 to 27kg, per minute. 127 mm Mark 5/6 guns were mounted as the main battery on Chester-class light cruisers, and as secondary battery on Delaware-class battleships. Moreover, they were mounted on a number of older ships. For example, in 1904-1907, cruiser Albany got ten 127 mm guns instead of here 152 mm and 120 mm guns made in England. In the 1910s, the Mark 5/6 was replaced by the 127 mm Mark 7/8 gun which had a higher rate of fire and better penetration capability. However, even during World War II, a few Mark 5/6 mounts could still be seen in the arsenal of auxiliary vessels and coastal batteries. Development of a new, rapid-firing 152mm Mark 6 gun was completed by 1900. Over the next decade, this artillery system, as well as its modified version, Mark 8, became widespread in the U.S. Navy. The gun's rate of fire was about 6 shots per minute, with a shell weight of around 48 kg. The elevation angle limited to 15 degrees ensured a firing range of over 13.5 km. 152mm Mark 6/8 guns became standard in the auxiliary artillery of U.S. Navy battleships and armored cruisers built in the 1900's. 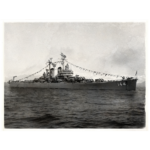 Only on St. Louis-class cruisers were they mounted as the main battery. After signing of the 1922 Washington Naval Treaty, most of the ships of the pre-dreadnought era were salvaged, and 152mm guns were massively passed on to the United States coastal artillery. Especially For Omaha-class light cruisers, a new 152 mm gun, the Mark 12, with an increased barrel length and a high initial shell velocity, was developed. According to the initial design, the armament of these ships consisted of ten single deck and casemate mounts. 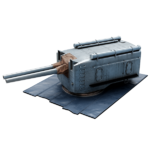 But then, in 1920, in order to surpass British C-class cruisers in broadside firepower, the Mark 16 twin-turret was developed. While the casemate-mounted artillery elevation angle was limited to 20 degrees, the maximum elevation angle of the turret barrels was 30 degrees, which ensured a theoretical firing range of more than 23 km. The creation of the Mark 16 turret was a milestone in the history of the development of cruiser types. The technological level of the previous, pre-dreadnought era ships did not allow for the creation of sufficiently reliable turret mounts with high-speed gun movement to improve aim at the target. Because of this, in the early 20th century, rapid-fire guns were placed on cruisers, as a rule, right on the deck or in casemates, which limited their firing range and did not ensure their reliable operation in difficult weather conditions. 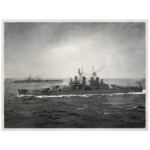 Commissioning of Omaha-class cruisers in 1923-1925 marked a gradual transition to the deployment of all main battery guns on cruisers in turret mounts. The main drawback of American 152mm guns of the 1900s–1920s was their relatively small shell weight, 48 kg, whereas almost all similar-caliber artillery systems of other countries used shells heavier than 50 kg. In 1932, for the new generation of light cruisers, the Mark 16 gun was developed. It was designed for a "super-heavy" shell weighing 59 kg, significantly superior to its counterparts in destructive power. 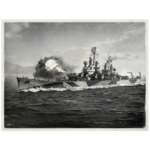 A triple turret with a highly automated loading process was created especially for these guns, which ensured a phenomenal firing rate for the time—up to 10 shots per minute. The relatively low initial velocity of heavy shells and close location of the barrels in the turret had an adverse effect on the firing accuracy over long distances. 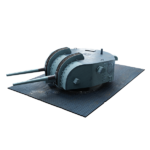 However, the turret's ability to shoot up to 30 shells per minute made it an extremely formidable weapon in close- and medium-ranged battles. This advantage was especially useful in the fast-flowing night battles between American and Japanese ships during the Pacific Campaign. 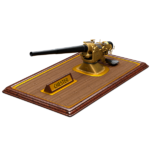 The idea of creating a dual-purpose gun with a caliber exceeding 127 mm arose in the U.S. Navy back in 1937, but it was not cast in metal until 1948, when cruiser Worcester was completed. As the main battery turrets, ships of this class used the same 152 mm Mark 16 guns as on Brooklyn- and Cleveland-class cruisers, which had the same theoretical firing range, around 23.8 km, and the same shell weight, about 59 kg. The fundamental distinction of the new mounts was their greater automation of the loading mechanisms and sigificantly increased capacity of the horizontal and vertical power drives. The dual-purpose 152 mm turrets of Worcester-class cruisers became the world's first mounts of such a large caliber that were able to fire effectively at air target. Their rotation speed was up to 25 degrees per second with the ability to shoot about 12 shells per minute from each barrel. 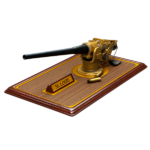 Such impressive features came at the cost of the mount's relatively large size and the immense weight of the turrets highly charged with mechanisms. The dual-purpose 152 mm twin mount weighed approximately 20% more than the 152 mm triple turret of cruiser Cleveland or Helena, which defined the USS Worcester's displacement, quite solid for a ship of this type. Developed in the United States by 1932, the 127 mm Mark 12 gun became the basis of the most numerous dual-purpose artillery system that existed in a multitude of variants and was mounted almost on every major U.S. Navy warship in the period from 1934 to 1945. The first dual-purpose twin turrets with mark 12 guns appeared in 1939. The were designated as Mark 29 and mounted on light cruisers Helena and St. Louis to provide them with long-range AA defense capabilities and, as an addition to the main 152 mm battery, to attack other ships and onshore targets, Atlanta-class cruisers which had 6 to 8 such turrets became the world's first ships of this type with dual-purpose mounts as their main battery. Mark 29 was a highly efficient artillery system. A heavy-duty power drive and reliable mechanisms ensured a horizontal aiming speed of 25 degrees per second, and a vertical aiming speed of 15 degrees per second. The turret guns had a nominal rate of fire of 15 shots per minute, shooting up to 22 shells—each weighing about 25 kg--per minute. The basis for dual-purpose artillery on the subsequent classes of American cruisers--Cleveland, Baltimore and Des Moines—was a slightly modified Mark 32 mount. 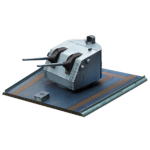 Unlocks the ability to mount two flags on all American aircraft carriers. 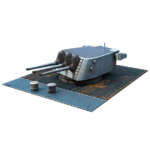 Development of the first American automatic AA defense system began in 1929 and was completed by 1934, when the resultant quadruple 28 mm mount could be brought into production. However, the tests revealed numerous deficiencies in the system. It took several years to eliminate them, so the new weapons were only delivered to the Navy in 1940. 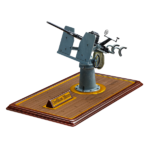 The automatic 28mm mount had a rate of fire of up to 150 shots per minute and was the first U.S. Navy AA defense system with power drive. Because of its low reliability, the 28 mm mount very quickly got its rather disrespectful nickname, Chicago Piano. Since the production rates of these systems could not meet the ever growing requirements of the Navy, the were never widely deployed on large warships. 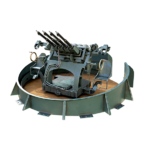 In 1942, after the beginning of mass production of 40 mm Bofors AA guns that considerably exceeded the Chicago Piano in their effective firing range, reliability, and power, the 28 mm guns were taken out of production. Reliability, a high rate of fire (up to 120 shots per minute), considerable height of engagement (over 6 km), destructive force of the shells (projectile weight of 900g) — this all made the 40mm automatic gun, developed by the Swedish company Bofors in 1930-1933, the most widespread AA artillery system. In the 1940's-1950's, it was used by dozens of countries around the world. Production of the 40mm Bofors in the United States began in 1941, but the Swedish gun did not satisfy the Navy in many respects, so the Americans introduced many improvements in the mounts design using, among other things, the British version of the Bofors. 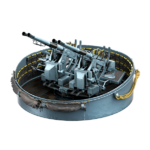 The mass production of the 40mm guns was deployed only at the end of 1942, yet they managed to satisfy the Navy's requirements in full only by 1944, when Bofors was able to finally replace the ineffective 28mm Chicago Pianos on ships. The Bofors was produced in a variety of versions: with air and water cooling; in twin, quadruple, and single mounts; with manual aiming and with a power drive. Unlocks the ability to mount two flags on all American destroyers. The Medal of Honor is the highest and most valuable decoration a service member can receive. The Army, Air Force, and Navy have their own specific versions of the medal. 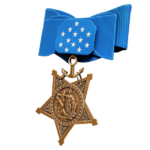 The Navy Medal of Honor was established in 1861, at the beginning of the American Civil War, and is the oldest version of the decoration. Only around 3,500 people have been awarded with any kind of Medal of Honor throughout its history. In the Navy, it can be awarded to anyone, from a simple sailor to an admiral. 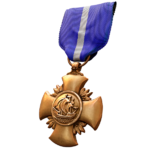 One of those to receive the Navy Medal of Honor posthumously was Rear Admiral Norman Scott, who commanded a squadron in the Battle of Cape Esperance in October 1942, the U.S. Navy's first surface victory of the Pacific Campaign. A month later, the admiral perished on the bridge of his flagship, cruiser USS Atlanta, in the initial naval battle of Guadalcanal. 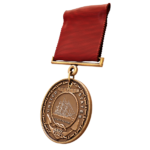 The Distinguished Service Medal was created in 1919 to reward senior commanders of the Navy and Marine Corps for their exceptional meritorious service while serving on duty. 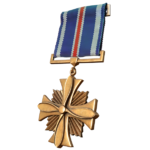 Originally, the medal was superior to the Navy Cross, but in 1943, at the height of World War II, these decorations switched places in the hierarchy of U.S. insignia. 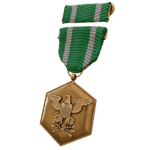 Many American naval commanders have received the Distinguished Service Medal several times. For example, Admirals Chester Nimitz and William Halsey received the award four times; Ernest King, Raymond Spruance, and Marc Mitscher received it three times. 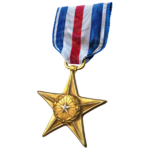 The Sliver Star Medal was established in 1932, becoming the fourth most important military award in U.S. insignia system. 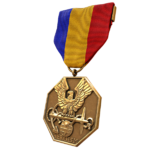 In accordance with the medal's statutory authorization approved in 1942, it can be awarded to service members of any rank and U.S. Armed Forces type for their courage and bravery shown in battle. The total number of Sliver Star recipients exceeds 100,000 people. Among the U.S. Navy officers awarded with the Sliver Star, There is also the Hollywood actor Douglas Fairbanks. In 1941, already a celebrity, he was called up for military service in the Navy. In 1943, Fairbanks came up with the initiative to create a military deception unit specializing in landing operations, which would later become known as the Beach Jumper program. For participation in the preparation and conduct of the landing operations in Sicily and in Southern France, as well as for his combat merit shown during his service on torpedo boats, Fairbanks received a number of awards, including the Silver Star Medal. 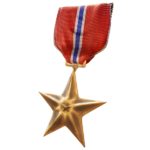 The Bronze Star Medal is the next significant U.S. decoration after the Silver Star Medal. 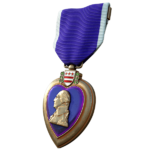 It was established in 1944 and is awarded for heroism manifested in a war zone.If an act of heroism is displayed in combat, the "V" Device (Which stands for Valor) is attached to the ribbon of the medal. 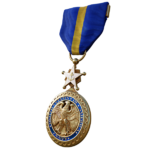 The medal can be awarded to service members of any type of the U.S. Armed Forces, including the Navy, as well as to civilians and as an exception, even to foreign citizens. Alternate color scheme for Types 1, 2, 5, and 6 camouflage for American cruisers. Effects of each type of camouflage are unaffected. 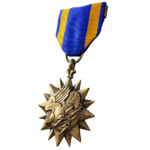 The Air Medal was established in 1942. It is awarded to U.S. service members for heroism and meritorious achievements while participating in aerial flight. One and the same person can receive a medal multiple times, in this case Oak Leaf Clusters are awarded on the Air Medal's ribbon. The legendary astronaut John Glenn, the first American to orbit the Earth, during the war in the Pacific Ocean, as a lieutenant in the Marine Corps, took part in dozens of sorties at the wheel of his F4U Corsair. For his services during World War II, he received two Distinguished Flying Crosses and ten Air Medals. The Navy ribbon was introduced earlier than similar insignia in other types of the U.S. Armed Forces, and their recipients had to meet more stringent criteria. As a rule, only Officers or senior Navy Chief Petty Officers in charge of units could receive it. In case of the award receipt for merits shown in combat, a metal Combat "V' (which stands for Valor) was attached to the ribbon. 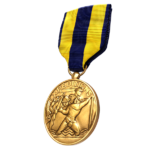 The U.S. Navy Expeditionary Medal was established in 1936 to reward Navy members, both officers and non-officers, who landed on foreign territory or were engaged in operations for which no special insignia is envisaged. Initially, the statute of the medal assumed retroactive awards—it could be awarded to participants in Navy operation since 1874, when a landing on Hawaiian Islands took place. Alternate color scheme for Types 1, 2, 5, and 6 camouflage for American battleships. Effects of each type of camouflage are unaffected. The rating of Gunner — or Gunner's Mate — is one of the oldest in the U.S. Navy. It appeared at the end of the 18th century, nearly simultaneously with the birth of the American fleet itself. 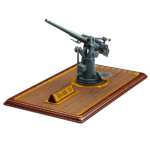 Gunners are not only those who service the weapons during battle; the rating also includes members of the team servicing shell magazines and gunpowder magazines, those who keep all artillery-related mechanisms in a serviceable condition, and those responsible for the ship's small arms storage. Until 1941, this rating also included gun fire control system maintenance personnel. The sleeve insignia of a Gunner's Mate was introduced in the 1860's and initially depicted two crossed gun barrels. The decoration acquired its design, which resembles its modern look, after the 1894 sleeve insignia reform. Until 1949, the patch was worn on the right sleeve, but since 1949, it has been worn on the left sleeve. At the beginning of the 20th century, the newly-appeared ranging equipment on ships required well-trained specialists. The intensive development of gun fire control systems in the 1920s-1930s resulted in a significant increase in the relevant service personnel. Eventually, in 1941, the U.S. Navy reassigned a specific group of Gunners to Gun Fire Control System Operators—Fire Controlmen. Their duties included rendering assistance to the Artillery Officers by operating optical range finders and ballistic calculators, as well as the maintenance and servicing of these devices. The sleeve emblem of Fire Controlmen contained the image of a range finder. Until 1949, the patch was worn on the right sleeve, after that, on the left sleeve. In 1948, a special rating of Fire Control Technician was singled out, while the rating of the Fire Controlman was eliminated in 1957. A separate rating of Torpedoman (since 1942, Torpedoman's Mate) was created in the U.S. Navy only in 1921, although ships armed with torpedo had already been part of the fleet for three decades by that time. Torpedomen were responsible for servicing torpedo tubes, their aiming at the target, and launching. Torpedomen's sleeve was introduced simultaneously with the establishment of the rating in 1921 and was abolished in 2007, when the rating of Torpedoman's mate was combined with the rating of Gunner's mate. Until 1949, the patch was worn on the right sleeve, since 1949, it had been worn on the left sleeve. The rating of Aviation Pilot existed in the U.S. Navy to designated aircraft pilots who did not have an officer's rank, unlike Aviators. This rating was introduced in 1924, during the early days of naval aviation. The Aviation Pilot's sleeve patch had an emblem of the rating, with an image of the naval pilot's sign embroidered with yellow thread, which distinguished them from other naval specialists. In 1948, the U.S. Navy scrapped the program of non-officer pilot training, and the rating was formally abolished, but it actually only ceased to exist in the 1980's, when the last sailor who wore the Aviation Pilot's patch left the Navy. Alternate color scheme for Types 1, 2, 5, and 6 camouflage for American aircraft carriers. Effects of each type of camouflage are unaffected. 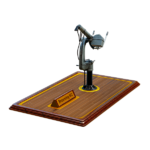 A separate rating for sailors who served radar equipment (Radarman) was introduced in the U.S. Navy in 1944, when radar systems were deployed on a massive scale on nearly every major American warship. The duties of the sailors of this rating included keeping all radar equipment in a serviceable condition, as well as its operation. In 1972, the Radarman rating was abolished. Initially, ship radars were operated by sailor who specialized as radio operators. Therefore, when the rating of Radarman appeared, their emblem was based on that of radio operators, namely a triplet of lightning bolts crossed by an arrow. The patch was worn on the left sleeve. Signalers have existed on ships for a long time, since the appearance of the flag semaphore and the system for transmitting messages using signal flags. Over time, time duties of signalers also naturally included observation of the water surface and, later, the situation in the air. Nevertheless, a special rating for signalers (Signalman) appeared in the U.S. Navy only in 1921. The sleeve patch of a Signalman depicted two crossed semaphore flags and, until 1949, it was worn on the right sleeve. In 1948-1949, the rating was merged with the navigation rating (Quartermaster). In 1959, it was restored (with the patch worn on the left sleeve), and in 2003, it was finally abolished. The rating of a supply handler or stockman(Storekeeper) in the U.S. Navy existed from 1916 to 2009. The Storekeepers' duties included storing, issuing and replenishing of various equipment, tools, and consumable items stored in the numerous storage facilities of a ship. The emblem of the rating contained two crossed keys. 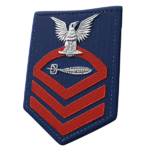 Until 1916, this emblem was used to refer to the specialty of ship's clerks. A Storekeeper's sleeve patch was worn on the left arm. The rank of Musician was established in the U.S. Navy in 1838, but the modern rating only appeared in 1944. The Musician's duties include keeping, if necessary, of the crew's morale and participation in all the numerous rituals and solemn ceremonies taking place on a ship. The sleeve insignia of the Musicians was introduced in 1886, the lyre became the rank's emblem. The patch is worn on the left sleeve. Alternate color scheme for Types 1, 2, 5, and 6 camouflage for American destroyers. Effects of each type of camouflage are unaffected. Alternate permanent camouflage for Cleveland. This page was last modified on 5 August 2018, at 00:04.